Realtors who sold in Inspiration and other Huffines communities in 2018 to a total of $1.2M won an all-expenses-paid luxury cruise experience for themselves and a guest through the iconic Caribbean islands of Grand Turk, St. Barths, Antigua, and Virgin Gorda. Eight days of fun, sun, friends, and excursions on our 2018 Realtor Rewards Caribbean cruise was a well-deserved vacation for our hardworking Realtors! Our group of 40 took up a large portion of our small, luxury Silversea cruise ship. Luxurious dinners, days at sea hanging out by the pool, group events like a masquerade party and sunset catamaran sails, and excursions for all at our four different ports of call left us with over 3000 pictures and memories to last at least until next year’s Realtor trip (learn more about our 2019 Rewards trip – a Rhine River cruise through Europe)! 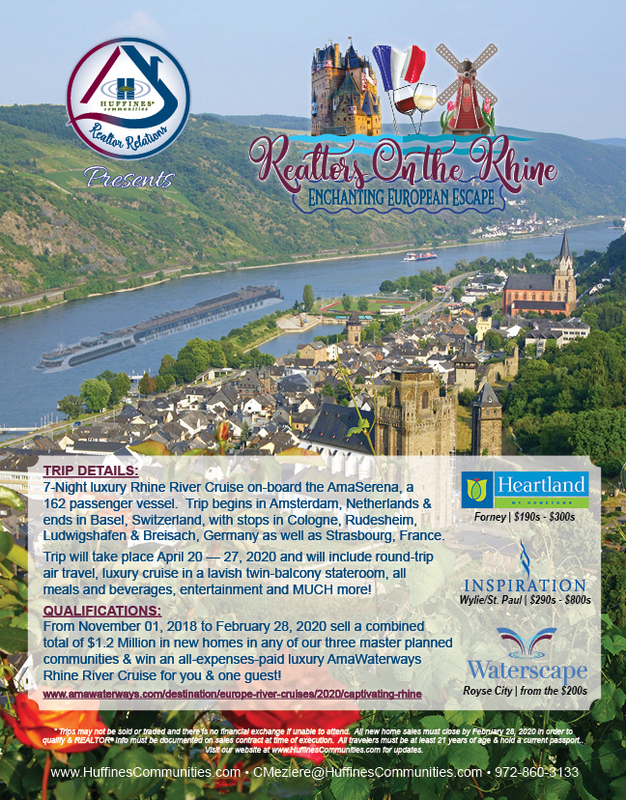 Realtors, you can join us on our 2019 Rhine River cruise through Europe in April 2020– just sell $1.2M in new homes in any Huffines community – here in Inspiration with new homes from the $290s-$800s, in our Forney community Heartland from the $190s-$300s, or in Royse City’s Waterscape from the low $200s. For more information, contact Chellie Meziere at cmeziere@huffinescommunities.com or 972-860-3133.